Israeli Aerospace Industries (IAI) is a globally recognized leader in the delivery of state-of-the-art systems for the defense and commercial markets. IAI offers unique solutions for a broad spectrum of requirements in space, air, land, sea, cyber, and HLS. It is the largest government owned defense and aerospace company in Israel. Over the past 60 years IAI delivered, supplied and supported advanced systems for the Israeli Ministry of Defense as well as many demanding customers worldwide. IAI develops and produces a wide range of cutting-edge satellites and satellite equipment, including observation and communication satellites, scientific/research satellite systems, ground control stations, mission centers, and launchers. With the latest members of OPTSAT-3000 (an electro-optical imaging) satellite product line, TECSAR (a Synthetic Aperture Radar observation) satellite line and AMOS communications satellite product line, IAI has utilized the advanced technologies, experience and know-how developed over the years to provide users with cost effective and comprehensive solutions for national security and commercial applications. SpaceIL is a non-profit organization established in 2011 aiming to land the first Israeli spacecraft on the Moon. The organization was founded by three young engineers: Yariv Bash, Kfir Damari and Yonatan Winetraub who answered the international challenge presented by Google Lunar XPRIZE: to build, launch and land an unmanned spacecraft on the Moon. SpaceIL is the only Israeli representative. SpaceIL is committed to inspiring the next generation in Israel and around the world to choose to study science, technology, engineering and mathematics (STEM). In October 2015, SpaceIL reached a dramatic project milestone by becoming the first team to announce a signed launch contract, that symbolizes an actual "ticket to the Moon". The launch will take place on an American SpaceX rocket. In January 2017, SpaceIL became one of the competition’s five finalists. 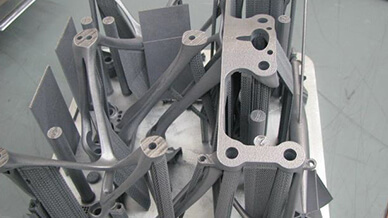 While designing the spacecraft’s thruster assembly, the team determined that it could achieve multiple benefits by pairing topology optimization with additive manufacturing. Specifically, the goal of the project was to design a 3D printed support bracket for the thruster configuration required for the SpaceIL program. Since there was no previous machined bracket for this program, the targets were defined in accordance with the program’s mass budget and the spacecraft’s static & dynamic requirements. 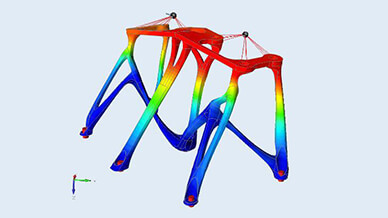 All of the topological optimization and design was done at designer level using Inspire and only the final validation required efforts of the stress analysis department. 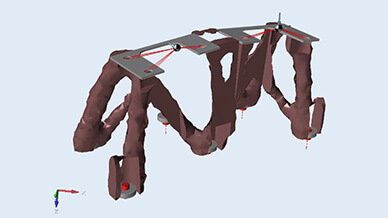 The first phase of the design process was to define the design space of the support structure and the non-design space. The design space included all the volume in which the team allowed material to exist, while the non-design space defined all the areas that the material needed to stay clear of (thrusters, tubing, harness, assembly hardware and assembly tooling). In addition, the non-design space includes the bracket interfaces to the thrusters and spacecraft. Next, the design space and non-design spaces were imported into Inspire. Constraints were defined at the base of the volume to the non-design volumes representing the interfaces. Rigid connections were attached to the non-design volumes, representing the interfaces to the thrusters. The connections connected to a 1D mass representing the thruster center of gravity. Three load cases were defined for g acceleration in the X, Y and Z directions. After the model setup, the topological optimization was initialized requiring the mass to be minimized while keeping a stiffness over 250Hz. Evolve was later used to remodel the optimized geometry output in Nurbs surfaces. The remodeling also considered additive manufacturing constraints such as build angle, support structure minimization etc. 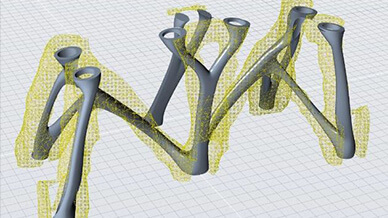 The outcome is a geometrical structure with continuous rounded surfaces suitable for additive manufacturing. Finally, the model produced by Evolve was then imported back into Inspire. The same loads and constraints were applied to it as in the original optimization run. The model was then analyzed and the natural frequency was verified in addition to the maximal stress values. After creating the final design, the next step for the team was to bring the 3D printed model to life. Materialise Magics was used to position the model on the build platform and supports were added to ensure a quality print. Once the part was printed, the supports were remove and additional machining was performed in order to provide the required interface surfaces. Prior to the vehicle launch, the part is being dimensionally verified where it will undergo actual mechanical testing such as sinus and random vibration testing. In 2019, the spacecraft was launched to the moon. For live updates, follow the Israel To The Moon Twitter page. Design a 3D printed support bracket for a space thruster configuration designed for the Google Lunar XPRIZE. Bracket optimization in Inspire and further refinement in Evolve. 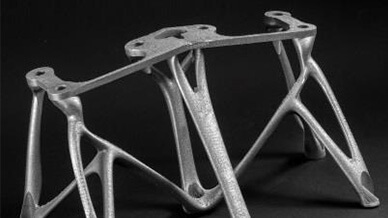 After design, bracket was produced with metal additive manufacturing. Successful implementation of topology optimization and 3D printing synergistically. 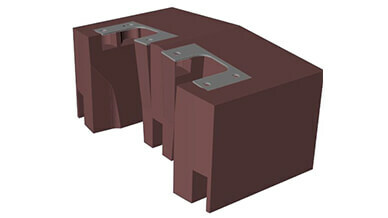 Design and manufacture of bracket strong enough to withstand space travel. Drastic reduction in design time compared to the initial base model. Israeli Aerospace Industries is a globally recognized leader in the delivery of state-of-the-art systems for the defense and commercial markets. IAI offers unique solutions for a broad spectrum of requirements in space, air, land, sea, cyber, and HLS. It is the largest government owned defense and aerospace company in Israel. Over the past 60 years IAI delivered, supplied and supported advanced systems for the Israeli Ministry of Defense as well as many demanding customers worldwide. SpaceIL is a non-profit organization established in 2011 aiming to land the first Israeli spacecraft on the Moon.